Take on this Water- and Dragon-type Pokemon for a limited time. 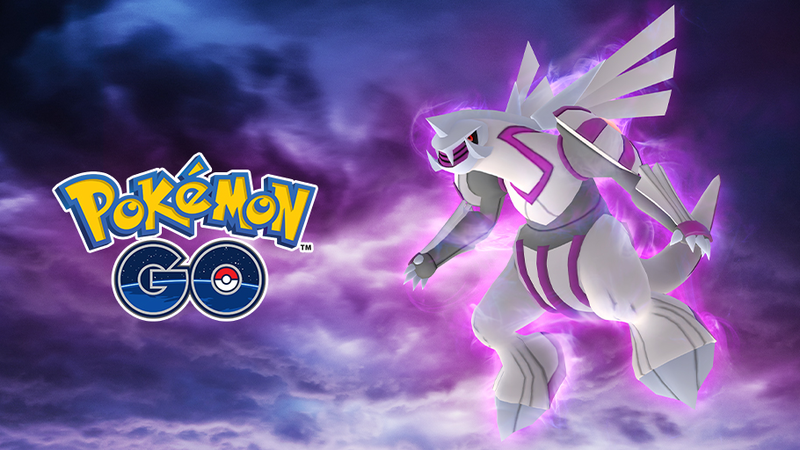 Trainers, it’s almost time to test your battle skills against a new Legendary Pokemon coming to Pokemon Go. From January 29 at 4 p.m. ET to February 28 at 4 p.m. ET, the Legendary Water- and Dragon-type Pokemon Palkia will appear in Raid battles around the world. Palkia is a Generation 4 creature, which was one of the exclusive pocket monsters in Pokemon Pearl. Pearl was released alongside Pokemon Diamond on Nintendo DS in 2007 in North America. For the next month, players from all three in-game teams (Mystic, Valor, and Instinct) can work together to take on Palkia in timed Raid battles. If players successfully defeat Palkia before the battle timer runs out, they’ll each have a chance to capture this awesome creature for themselves. On the Pokemon Go website, the game’s developer, Niantic, says players should create a team of Dragon- and Fairy-type Pokemon to take on this formidable opponent. According to Pokemon Go Hub, the best Palkia counters are creatures like Rayquaza, Dragonite, Salamence, Latios, and even Palkia itself, once/if you capture one and want to use it in another Raid battle later on. Interestingly, this Pokemon Go update doesn’t mention Dialga, the major Legendary creature from Pokemon Diamond. But since Palkia is coming to Pokemon Go, we expect Dialga will make its appearance soon.